Hadad Silversmiths created this 925 Sterling Silver Kiddush goblet with matching saucer to decorate your Shabbat & Holiday table. Made in Israel by Jewish Laborers. Total Silver Wt 119g. 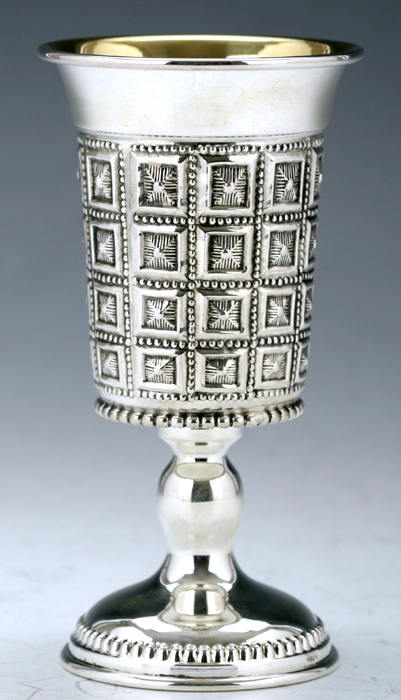 Embossed box pattern, reminiscent of the Anvei HaChoshen breastplate worn by the High Priest of Israel, covers the cup of this lovely sterling silver goblet, while a thin beaded trim edges the bottom of the kiddush cup and the foot of the goblet. The goblet holds the Shiur [halachic amount] of wine required for Kiddush.